This section is from the book "A Textbook Of Domestic Science", by Matilda G. Campbell. Also available from Amazon: A textbook of domestic science for high schools. 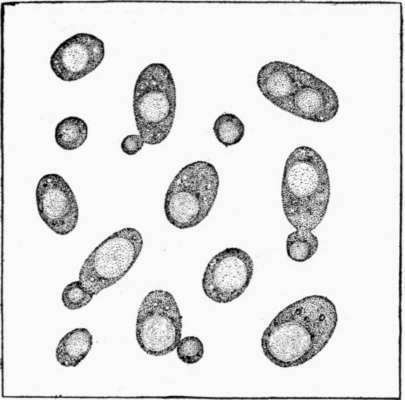 Yeast Plant (magnified), showing method of reproduction. Yeast is a single-celled plant that grows by budding, and requires sugar, some protein, and mineral matter for its nourishment. It is found floating in the air and settles on substances rich in sugar, where it grows and causes a chemical change in the substance upon which it is feeding, called fermentation. This is the change which takes place when grape juice is changed to wine, when cider becomes "hard," or when "salt rising" bread is made. Yeast is obtained in a pure form for commercial purposes from distilleries or breweries. The top yeast which floats on the surface of the fermenting liquid, or wort, is skimmed off and its impurities removed. It is then mixed with some starch, pressed, cut into cakes, wrapped in tin foil, and sold as "compressed" yeast. When mixed with corn meal and dried, it is sold as "dry yeast." The yeast cells of dry yeast are not as active as those of compressed yeast and take longer to raise bread. Fermentation is a chemical change in an organic substance, caused by the growth within that substance of some ferment, as yeast. There are different varieties of ferments, each of which causes a different form of fermentation to take place. Alcoholic fermentation is caused by the growing of the yeast plant, which feeds upon sugar, changing it to alcohol and carbon dioxide. This is the fermentation that takes place in bread making. Acetic fermentation is caused by a ferment which changes the alcohol formed during alcoholic fermentation into acetic acid. It occurs when alcoholic fermentation is allowed to go on for too great a length of time, or when the mixture is raised to a temperature above 90° F., as when hard cider turns to vinegar or bread dough sours. Lactic fermentation is the change that takes place when milk sours. The lactic bacillus feeds upon the sugar of the milk and changes it to lactic acid ; this acid causes the casein to coagulate and the milk is "sour." When milk is used for bread dough, it should be scalded to destroy the lactic bacilli, thus preventing souring of the milk during the rising, which might cause sour bread. Mix a small amount of yeast with water. (a) Put a drop on a glass slide, cover with a glass, and examine under the microscope, first with a low power and then with a high power. Make a drawing. (6) Stain the slide with a little iodine and examine again. What color do the yeast cells become when they are stained with iodine? The starch cells ? What kind of starch was used in the yeast cake? Make a solution of glucose and water, or molasses and water. Add some yeast. Let stand an hour or two in a warm place. Examine a drop under the microscope. How does the yeast cell reproduce? Make a solution of glucose and water. Add some yeast. Put equal amounts in three test tubes. (a) Boil the contents of one tube. (6) Put one tube in a cold place or on ice. (c) Keep one tube at temperature of 80° F. At the end of an hour or two, examine the contents of the tubes, noting any fermentation that may have occurred. Draw conclusions as to the best temperature for the growing of the yeast plant. Warm (6) to a temperature of 80° F. and let stand for an hour or two. Does cold destroy the life of the yeast? Does boiling destroy it? Put a solution of glucose, water, and yeast in a flask. Keep it warm until it ferments. Pass the gas through lime water. What change occurs in the limewater ? What gas is given off during alcoholic fermentation? Proportion of ingredients in bread making. 1 cake yeast dissolved in 3/4 c. lukewarm water, or 1 c. liquid yeast. 2 tb. or more of sugar. In white bread use just enough sugar to replace the sugar of the flour lost during alcoholic fermentation; in other breads use sugar as desired for a flavor. Two tb. shortening (lard or butter). The amount of shortening may be increased for rolls or when a rich fancy dough is desired. For simple breads shortening may be omitted entirely. Flour to form a soft dough. If spring wheat flour is used, a smaller quantity will be required than would be needed of winter wheat. From two and a half to three times as much flour as liquid should be used, which includes the flour used on the board in kneading. With dark-colored flour, use about one-third white flour and the remainder dark flour. Doughs made with graham or entire wheat flour, which contain a large amount of gluten, are not made stiff enough to knead, but are well beaten with a spoon before being put to rise.